Today, you’re in for a treat. My guest, Jen Casey, is someone I really look up to. She mainly works with online coaches in health and wellness, as well as network marketers, essentially teaching them how to think like a top earner. Her specialty is mindset, particularly using through the use of NLP. NLP (Neuro-linguistic programming), in case you’ve never heard of it, involves using a series of practices and processes that can upgrade the way in which you think and act. You’re going to want to listen to today’s podcast at least twice… I know I have. While today’s things get a little technical, Jen is great at breaking things down into a way that we can relate to. While you’ve spent most of your life thinking the same things and carrying out the same behaviors, it’s no wonder why your current set of circumstances are the way they are. If you’re not happy with your current results, then now is the time to change them. Pretend that all your prayers have been answered and that you have everything you could possibly want. Imagine what the seven-figure version of you looks like and write out what you see in detail. How does that person act? If it feels good then that’s your emotional guidance system (or God) telling you that’s where you need to aim for. If you’re truly ready to learn a bit more from Jen and what NLP has to offer then listen to the podcast on iTunes today. Why you need to niche down – When pitching to your niche, you have to get over the mindset of trying to market to everyone. It’s far more important to have a very clear and narrow niche. You can even explicitly state who you don’t want. Using NLP in business – Jen helps people make radical changes in their lives. Given that 92% of our thoughts are the same thoughts from yesterday, it’s not always easy to make a positive change on your own. However, using NLP, Jen explains that it’s totally possible to change the patterns that go on in people’s lives (and heads). Don’t think of a blue tree – Your subconscious doesn’t understand negative commands. If you’re told “don’t think of a blue tree,” then all you can think about is a blue tree, right? Therefore, never set a goal like “I want to get out of debt,” as you’ll have a hard time not visualizing debt. The right state – Never try to close a sale when a person is in a negative state. After discussing their problems, help them picture themselves being successful in the future. And once you’ve elicited this positive state of mind, that’s the time to close them. The Communication Model – Your results in life are determined by your behavior… Which is determined by your state… Which is determined by your thoughts: the sounds and pictures you create in your head. Your brain filters the millions of pieces of information it receives every single day. Everything is a process… And processes are changeable. Your emotional guidance system – Want to change your state of mind? Start paying attention to how you feel, and what you’re thinking about when you’re feeling that way. Then you create the power to change your thoughts. This episode was brought to you by my premium program Services that Sell. If you’ve been thinking about niching down and creating a four-figure service that you can sell consistently, And if you have been searching for a simple way to sell your services without a complicated funnel, I encourage you to sign up for my FREE masterclass at jereshiahawk.com/masterclass. 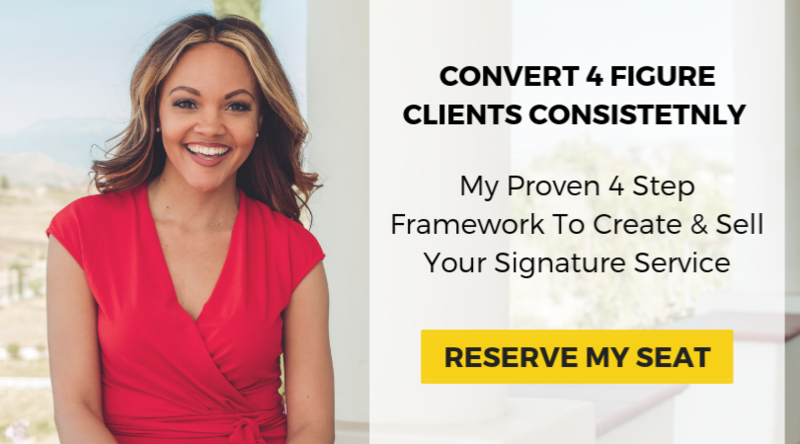 I’ll make sure you know everything you need to gain the clarity you crave to confidently sell your services online.